This is my third year writing a Day of the Dead blog post to honor the Southern Resident Killer Whales that we've lost during the preceding year. Unfortunately in the last 12 months, we've lost an astounding seven whales. J48 was the fifth offspring born to J16 Slick. The calf was first seen in December 2011 and was missing the next month. I didn't get to meet this little whale, who in addition to mom left behind three surviving siblings: J26 Mike, J36 Alki, and J42 Echo. The death of L112 Sooke remains particularly sad and mysterious. I documented her story in detail in a separate blog post. She washed up on a beach in Long Beach, Washington in February 2012 with blunt force trauma. The exact cause of her death has not been determined, but a necropsy showed that her wounds were not consistent with a ship strike or predation event. Following her death, activities of both the US and Canadian Navy received a lot of scrutiny, from underwater sonar testing to the bomb range that exists off the Washington coast. Hopefully, the result of all this is that additional precautions be put in place to protect this endangered population of whales from underwater noise and explosions that could lead to permanent injury and death. In the near future her skeleton will be on display at The Whale Museum in Friday Harbor. It is always sad to lose a whale, particularly a young whale, but even more so a young female. 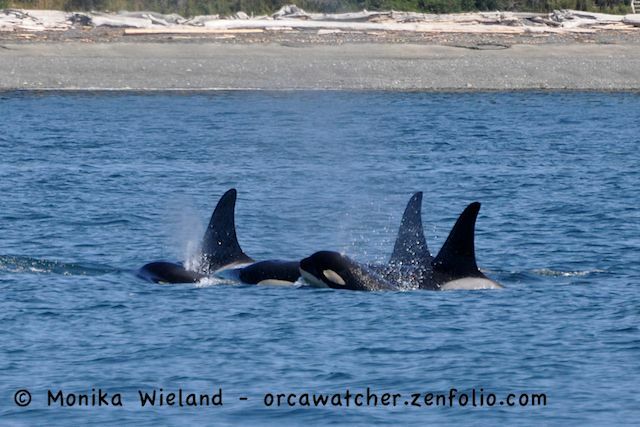 L-Pod does not have many juvenile females, without which this population has no chance of recovery. Sooke was one of the few. I was shocked when I heard that J30 Riptide had not been seen this spring. J-Pod has always seemed like the most resilient of the three pods, but Riptide is the second young adult male in the pod to die prematurely in recent years (the other was J33 Keet in 2010). 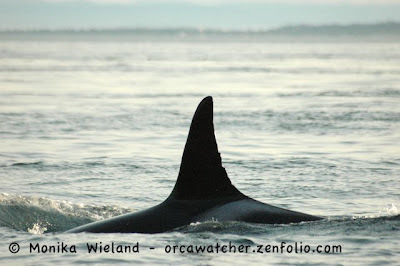 Riptide was the second known offspring of J14 Samish and despite being just 16 years old already had a huge dorsal fin that was nearly fully grown. One of the very first pictures I took of Riptide shows him with J1 Ruffles, and the two proved to be regular companions over the years until the death of Ruffles. 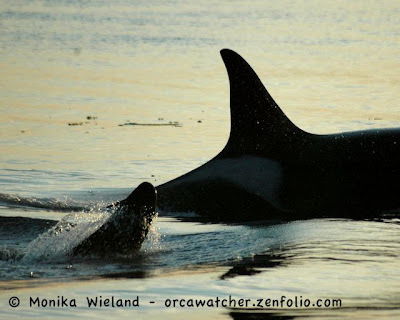 That's why I chose to honor him with the above picture, showing the two males together in Boundary Pass several years ago. I imagine Riptide must have been learning a lot from the oldest male among the Southern Residents, and it's a shame he won't be able to put the knowledge to use as a breeding adult male. Riptide is the probable great grandson of J2 Granny and also leaves behind three younger siblings. At an estimated age of 79, Alexis lived the long, fruitful life of a matriarch resident whale. She's the namesake for the L12 subgroup, a well-known portion of L-Pod that tends to spend a lot more time in inland waters than the rest of the Ls. Her strong ties throughout her life with the L28 and L32 matrilines seems to be a key reason these three families travel together so much of the time. She was often associated with both of these mothers as well as with their offspring, and late in her life seemed to have become the adopted mom of L85 Mystery, the son of L28 Misky. The probable grandmother of the iconic male L41 Mega, Alexis, like Mega, also had two notches on her dorsal fin that made her distinct. Earlier this year I wrote a creative piece imagining a day in the life of Alexis where she was surrounded by her extended family. A mainstay throughout my whale watching years and well before that, I had no idea I would never see her again. 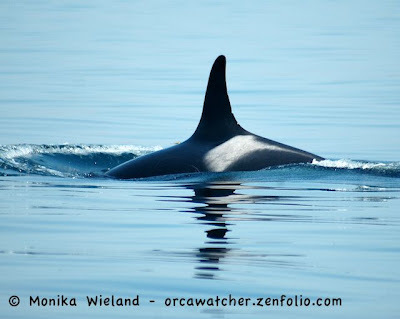 Unlike Alexis, L5 Tanya was part of a group of L-Pod whales that does not spend a lot of time in inland waters. As such, I never got to see too much of her, and was always excited when I did as she remained a more unknown whale to me. She only had two known offspring, both sons, and both very distinct males. L58 Sparky was one of the first few whales I learned to identify around the year 2000. He was easy to pick out because this was a time when there were only 3 or 4 fully adult males in the whole population. Her other son, L73 Flash, was a bit of a Ruffles lookalike. Unfortunately both sons preceded Tanya in death. Tanya had a bit of a unique dorsal fin, at least to my now more highly trained eye. The middle of the back trailing edge seemed to bulge out, easily seen in the above photograph where she is silhouetted. She also had a distinct line across one of her saddle patches, and a testament to how rarely I saw her is the fact that I never got a great picture showing this unique marking very well. With her passing, Tanya leaves behind young male L84 Nyssa, her sister's grandson, as the only surviving member of the L9 matriline. Raggedy! I still can't believe you are really gone. Talk about a whale with a unique history, of which we only know a very small piece. One of the unknown parts is how she got all those notches that made up the tattered trailing edge of her dorsal fin. I first learned about Raggedy's interesting family when I wondered how she was already numbered the 40th whale in K-Pod when at the time there was no K39, K38, K37, and so on. 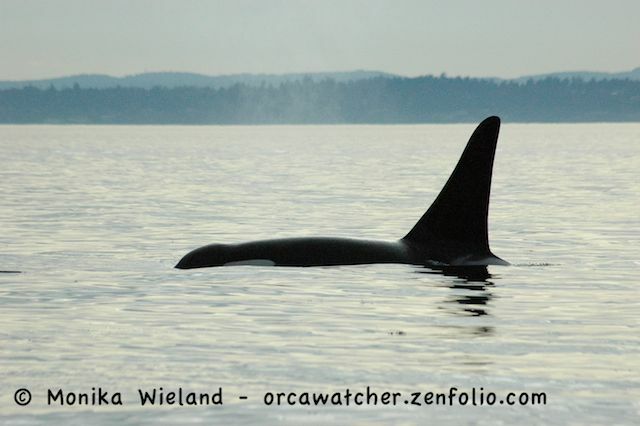 It turns out this is because she, along with the rest of her family group, were originally designated as L-Pod whales. Before 1977 they were always seen with L-Pod. Then, between 1977 and 1981 they started being seen with Ks, and after 1981 were almost always seen with Ks. Michael Bigg suspected they might be Ks due to their acoustic call types, and in 1986, coinciding with the birth of K21 Cappuccino into this family group, the switch from L to K was officially announced, the only time any whales have had their pod designation changed. Raggedy's family was our first clue that matrilines are probably more stable than pods, as we've seen other whales and groups of whales seemingly shift pod associations for both short and long lengths of time. While there is a genealogy written out for this group of whales (the K18 and K30 matrilines), it seems the mother-offspring relationships have never really been clear as the family associations were reorganized several times. What is known is that Raggedy was never seen with a calf, leading to speculation that she was probably infertile. 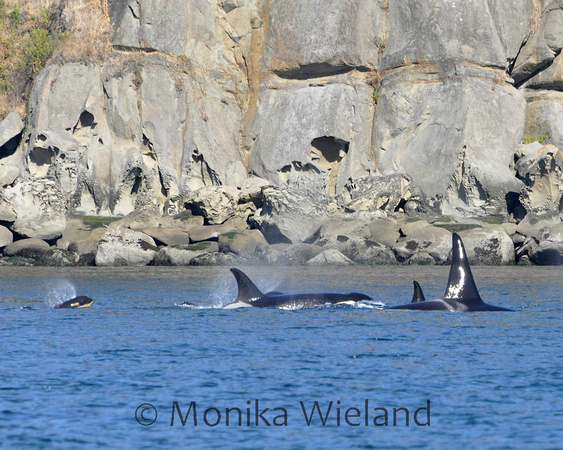 One of my first-ever whale encounters was with Raggedy and her suspected mom, K18 Kiska, and probable brother K21 Cappuccino. I was aboard the Bon Accord in Haro Strait. The boat was parked as we watched a social multi-pod gathering milling about when we were surprised by three whales that popped up closer to us than all the rest: Kiska, Raggedy, and Cappuccino. This was the first time I had ever been this close to a wild whale, and the video camera I had rolling at the time recorded my frantic, excited comments as Raggedy surfaced right beneath me. "I got wet from the spray!" I called out in a shaky voice. "Oh my God!" There was no going back for me from that moment. Raggedy leaves behind her stalwart companion Cappuccino. In recent years these two whales have often traveled between pods with K16 Opus and K35 Sonata, continuing the rogue ways of the family group. Early sightings indicate Cappuccino, Opus, and Sonata will carry on the unpredictable tradition in Raggedy's absence. L78 Gaia is another whale from a very independent family group: the L2 matriline. At just 23 years old, it also feels like we lost Gaia way too early, but unfortunately he follows a trend of other L-Pod whales that we have recently lost in their 20s. Since 2008, the family group has just been made up of L78 Gaia, mom L2 Grace, and Gaia's younger brother L88 Wavewalker. The three whales were sometimes seen with no other Southern Residents. 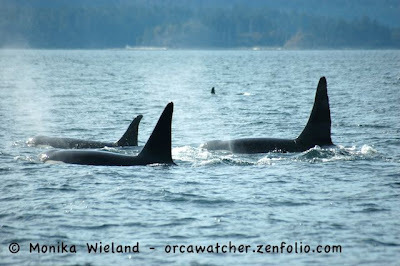 On one memorable day they were spotted near Lopez Island and initially identified as transients since there were only three of them, though this is a bit hard to believe since all three have distinct open saddle patches that transients never sport. Gaia was the uncle of L98 Luna, the young whale who somehow got separated from his mom and spent years alone in Nootka Sound off the west side of Vancouver Island. In 2009 Gaia showed up with a wicked scrape on his dorsal fin, a wound so gruesome observers worried it could become infected. He seemed to heal up from this just fine, and it wasn't too long before he had just a faint scar on the front of his dorsal fin. I always thought of Gaia as having a very broad dorsal fin, one that will truly be missed by me among the other L-Pod whales. So those are the whales we have lost this year - unnamed J48, Sooke, Riptide, Alexis, Tanya, Raggedy, and Gaia. We have had just two new arrivals in that time. L119, a girl, was born to L77 Matia, a calf I was very happy to hear about. Both Matia and her sister L94 Calypso had calves in 2010, but Matia lost hers, and I could only imagine what it was like for her as a bereaved mom to watch her younger sister with a healthy baby. It must have been very bittersweet. Now she has another little youngster of her own, which amazingly I never got to meet this summer. Perhaps an indicator of the shifting patterns as a result of Alexis' death (Matia and Calypso, along with Mega, are also her probable grandchildren), the L12s did not spend nearly as much time doing their regular westside shuffle off of San Juan Island this summer. I saw very little of this family group this year and look forward to seeing both sisters with their healthy calves next year. The other birth was J49, a boy, born to J37 Hy'shqa. In a rare case of a Southern Resident being born in inland waters, we actually know the birthday of J49 is August 6th, and he was born somewhere around Turn Point on Stuart Island. With his birth, Hy'shqa became the youngest mother on record at just over 11 years old. I was worried about these two whales, since the other young mom I witness (K28 Raven was just 12 when she gave birth to K39 in 2006 ) both perished shortly thereafter. But so far, both mom and calf seem to be doing just fine, and Hy'shqa has lots of help from her extended family. 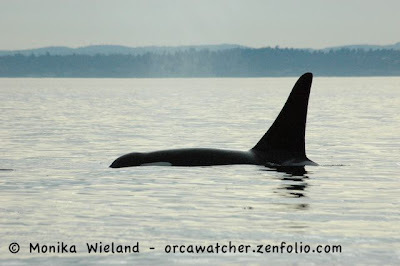 J49 is the first grandchild to productive mother J14 Samish and is also the first great-great grandchild to J2 Granny. This years births and deaths leave us at 84 whales in the Southern Resident Community. To the ones you have lost, you will be dearly missed, and to those that have arrived, we welcome you and hope you live to see the recovery of this endangered population. What a long and impressive post. So nice that you pay respect to these whales. Sad that there were so many this year. I almost cried reading through this. What a beautiful post. Thank you for taking the time to write this, Monika. The photos posted are wonderful and perfect reminders of how majestic these creatures are. In 2008 didn't the local pods loose eight whales? I remember folks saying that was a record at the time. 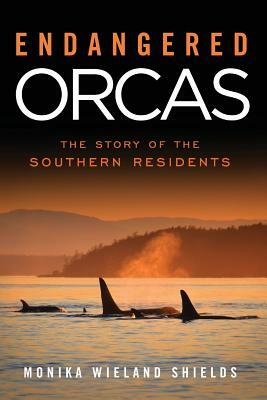 Thank you for documenting this for us to read as our family continues to learn about these magnificent animals. We had whales this year a Rosario, just incredible. So sad to understand the number is losses.